Welcome to the Douglass Red Devils! Serving a community rich in Memphis history and one continuing to thrive to this day! Yappics Graphic Design & Publishing is proud to be providing a continued free service to all of Douglass students and graduates. We have much more work to do in improving the already high level of professional standards and services offered to the Douglass community. 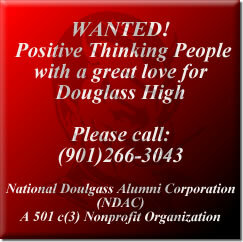 We not only represent Douglass......but the best that Memphis has to offer! Douglass Alumni Association 2009 Election Winners! The 2009 Douglass Alumni Convention will be held in Washington D.C.
Any and everyone can purchase bricks to be place in the school, on the "Memorial Wall" for a friend or loved one. Please help to locate anyone you know in the class of '79. assumes NO resonsibility for how information on this site is used or dissiminated. web design by: ©1998-2011 Yappics Graphic Design & Publishing™ All rights reserved.